Having a black thumb is not only a personal burden but its a plight on the whole neighborhood. You would think that with so little outdoor space to worry about (most of it concrete! ), it wouldn't take long to have some lovely container gardens in place. Well, you'd be wrong! I just don't have the knack or the desire. So last weekend we finally put out some living things to celebrate spring. Fully acknowledging my complete lack fo skills in this department, I went with the easy to maintain plants. Its pretty shady out front so that limited my plant selection anyway. I followed something I read a while ago about having a showy plant, a tall plant and a plant that spills over. Check, check, check. And yes, I do garden with a tablespoon. No fancy tools for me. The cat was sure something was majorly wrong when he spotted me out of doors, hands in the dirt.  One very small step for Brooklyn Limestone. One great leap for my poor neighbors who have had to look at those pathetic empty pots. We've had a lot of rain so thus far, the plants are still alive. Wish them luck, they will need it! I love your "showy" plant. I think I will use something similar on my front porch this summer. I share your plight of the black thumb and am crazy enough to try to grow vegetables this summer! Love it. I need to do the same. Although, I will say, if you allow enough of one type of weed to grow large enough it starts to look like you are growing an exotic plant on purpose. Oh - its blight, not plight. As in, the plight of the neighborhood worsened when Deb's empty pots were a blight on her front porch. Just found your blog today! HI! Love this post. Lets me know I'm not alone in the gardening challenged department! This weekend I too did some container planting I am proud of. Of course a silent prayer was made after the last watering! Looks great! I, too, am cursed with a "black thumb" to the point where BF barely wants to get me flowers bc he knows I'll prob kill them before their prime! They look cute! Container gardens are a great way to improve your thumb's greenness. I foolishly left our faux metal planters outside all winter, and the paint chipped off. So before I put new plants in there I need to find some plastic-friendly spray paint. I'm so glad I'm not the only one who can put together a room but can't keep a plant alive and doesn't really want to either! Your urns look great! Good luck on keeping them alive, they really do look pretty!! Oh my lord I have a black thumb too! It's pretty pathetic really, seeing that my mother has the most beautiful garden known to man. Why didn't I get some of those genes? I have to work on our window boxes this weekend. Fingers crossed all the plants will live. Thanks for the lovely inspiration! Water often! They'll do fine! Do those pots have drain holes in the bottom? If not, that could be the answer to your black thumb! I have been telling myself for a couple of weeks now that I need to get some plants/flowers for the planters (that have been completely void of everything including soil since the day we moved in 1 1/2 years ago). But have I? Of course not. Maybe this weekend will finally be the one! Love your choices! Anon: yes, there are holes in the bottom. I know the basics, I just don't have that special touch. Colius probably spelled wrong is fool proof , just keep it watered and it will do great , when it flowers you can pinch them off which will encourage more growth , I'm sure you will have great success with those . I love container gardening. Your plants should do fine. Just give them enough water and don't put too much. You will drown them. They are pretty! I killed a couple of IKEA cactus plants so I've been wary about buying new plants. Let me know if these survive your black thumb! I'm working on my container gardening this weekend. Best of luck with your plants, they look great! I think I like the cat better though!! I have a very similar plant mix on my front porch! I love planting and spent all weekend doing just that. Sometimes I must admit I miss my easy concrete patio in Kuwait though. Your choices look great. Do you plant on the back patio as well? Love what you did! Yo have a great green thumb! Come to my house, please? and your cat looks so cute staring out the window! love it! I like the look on that cat's face. So cute! Miracle Grow once a week will have your plants the envy of the neighborhood. Holla to my black-thumbed peeps! My grandma can take a tiny seed, put it in dirt, add water and get a beautiful seed. I can put a seed in dirt, add water and get a muddy seed. Sometimes I think the seed turns into a rock just to spite me. I have, however, managed to keep some aloe vera and a rose bush alive thanks to those handy glass bulb thingys that allow for slow, as-needed watering. Also, my cat regularly "prunes" my rose bush for me. Love the plant selection. Your little helper kitty is darling too.